Tulalip basketball league – Spring season Champs. 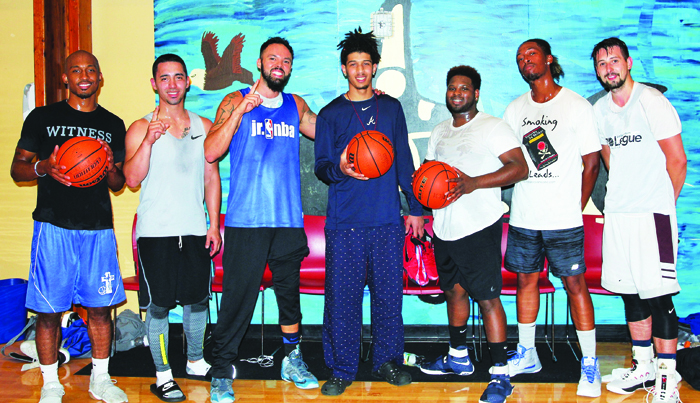 Established in February 2015, the Go Hard or Go Home community basketball league is organized by Youth Services staff and has gained more notoriety with each passing season. Local ballers can be found competing on the hardwood every Monday and Wednesday evenings at the Tulalip Youth Center. The league is a prime outlet for basketball players of every level. And most importantly, everyone is welcome to participate. There are former high school stand-outs, a couple college players, but mostly people who just love the sport. After paying a modest fee of $200, each team played a nine-game regular season and everyone had a spot in the postseason playoffs. Giving Tulalip ballers the best bang for their buck has been a priority of the community league. In fact, costs have been minimal and the amount of games plenty when compared to most basketball leagues. Spring season saw nearly ninety players make-up the ten teams vying for bragging rights and making the most out the opportunity to play competitive, localized basketball. Ages ranged from early teens to elder statesmen. This entry was posted in News, Sports, Tulalip News and tagged Basketball, Go Hard or Go Home, Tulalip by Kim Kalliber. Bookmark the permalink.